"DEAN!" Dean smiled and ran down the hall, ignoring his mother shouting after him. The occasional maid smiled or said a quick &apos;your highness&apos; as he dashed past. When he was sure he was no longer being chased, he ducked into the kitchen. As out of place as he was, he was barely noticed due to all the commotion. There was a banquet being held tonight, in honor of Dean&apos;s 12th birthday. There was a grand cake sitting on a tray, waiting to be brought out in a few hours or so. But until dinner, Dean was free. He wandered through, dodging staff as they scurried around, adding final touches to the feast. He finally made it to the back of the kitchen, where he saw Chef Smith talking to a boy about Dean&apos;s age. Curious, he got closer, so he was within earshot. "Castiel, this is your home now. You&apos;ll work in the kitchens, delivering food if you&apos;re asked. The prince likes to sneak down here at night, steal food, so if you see him, send him out. Ah, here he is now. Your highness," Chef took a bow while Dean smiled. He looked at Castiel and his smile immediately faded. He looked terrified, and he was clearly fighting back tears. "This is Castiel, our newest addition." Castiel gave a bow, and Dean sighed. "Castiel, I&apos;m going to stop you there. You don&apos;t have to bow to me, you&apos;re my age. It&apos;s been too long since anyone my age was in the castle, so please treat me like a friend instead of a power to be feared. Chef, you&apos;re dismissed, I&apos;ll take on showing Castiel the castle." Chef frowned, but nodded. He walked away, and Dean looked at Castiel. "Come on, follow me." They walked out of the kitchen, dodging people while Castiel followed Dean with his head down and tears brimming in his eyes. As soon as they were out of the kitchen, Dean pulled Castiel aside. He sighed, and knelt down a little so they were eye level. "Look, Cas, I&apos;m going to call you Cas, I know what happens down there. And I don&apos;t like it. I have an idea how you got here, but I promise I&apos;m going to make this place more a of a home to you then wherever you came from was. As soon as I take the throne, this whole system is crashing down. No other kids will ever end up the same way you did. Now come on, you&apos;re my royal guest for the feast." He led Cas to his room, and grinned at the maid. She did a quick curtsy, then eyed Castiel. "Your highness, may I ask what you&apos;re planning?" She smiled, and Castiel&apos;s nerves cleared up a little. Clearly the prince was a little mischievous, and this wasn&apos;t the first time he had broken the rules. "Carla, this is Castiel. I found him in the kitchen when I was hiding from my mother, and he&apos;s the new help around here. So, in honor of his first day in his new home, he shall be my royal guest at tonight&apos;s party. As you can see," he gestured at Cas&apos;s plain clothes,  "he&apos;ll need some proper attire. I&apos;m allowing him to borrow some of mine." He stepped back, and Carla looked Cas up and down, walking around him to get a good look. She looked at Dean, then nodded. "Yes your highness. I have the perfect outfit." She walked into a large closet, and came out about 30 seconds later holding a plain white button up and beige pants that seemed far finer than the denim Cas was used to. He shot Dean a look of concern, and grew more nervous when he saw the grin on his face. "Thank you Carla, that will be splendid. Cas, I assume you need no aid in dressing yourself, so Carla and I will wait in the hall. Please call me back in when you&apos;re properly clothed." They walked out of the room, leaving Castiel alone and scared. Carla turned on Dean, fully prepared to scold him into next week, but Dean held up a hand to silence her and put a finger to his lips. "I am aware of the absurdity of the situation. But Carla, did you see him? Poor boy is scared out of his wits. He can&apos;t be more than 10. I know how you got here, and he had to have gotten here in very similar circumstances. So not only am I taking pity on him, I&apos;m giving him a chance to have a real friend and a decent life, which is what any child deserves." She considered this, and sighed. She nodded, and their conversation was finished by a timid face poking out of a crack in the door. "Your highness, I think I need some help." He stepped back and allowed Dean to step inside. "Please, call me Dean." He smiled at Cas&apos;s problem. Clearly his family was never accustomed to the finer things. He had no idea how to button his shirt. He stepped closer, and started working his way up with the buttons. "I know this must be a rough day for you. But I promise better days are ahead. For both of us. No matter what, I&apos;ve got your back, okay?" He finished, and looked Cas in the eyes. They were close, really close. And Dean was struck by just how blue Cas&apos;s eyes were. They were brighter than any ocean he&apos;d ever seen, bluer than the sky on it&apos;s brightest day. His breath caught, just a little, and he blushed. He backed away and smiled at Cas, ignoring the awkwardness in the room. They stood there like that for a moment, until they were interrupted by a knock at the door. They looked, and Carla poked her head in. 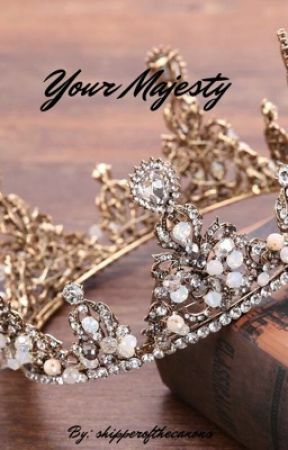 "Your highness, the queen wishes to see you. Shall I send her in?" Dean sighed, knowing how much trouble he would be in tomorrow. 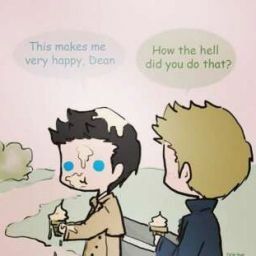 But it was worth it to give Cas a day in the good life, the life he deserved. "You know you couldn&apos;t stop her if you tried, Carla." He walked over and sat on the bed, and Cas did the same. There was distance larger than Dean wanted between them, but he couldn&apos;t remedy that with his mother in the room. "Dean James Winchester, you are in so much- oh hello, and who might you be?" Cas stood, and bowed deeply before the queen. "He&apos;s with me mother. This is Castiel, and he&apos;s my new friend. He&apos;s going to attend tonight&apos;s party as my royal guest, and thus I wish for him to be seated right next to me. Please?" She considered all this, then sighed. She couldn&apos;t turn a little boy down, or upset Dean on his birthday. "Okay. I&apos;ll notify the staff, but we are going to have a discussion about your behavior tomorrow. Understood?" He nodded, and she walked out of the room, thanking Carla as she left. Dean took a moment to catch a breath before he turned to Castiel. "Okay, look. You&apos;re going to get a lot of questions tonight about who you are and how I know you. My guess is you don&apos;t really want to tell them the truth, am I correct?" Cas nodded, and Dean continued. "So your story is that you&apos;re the son of a duke from a neighboring kingdom, and my parents invited you here in the name of diplomacy. Your parents couldn&apos;t come because the people are rioting and they can&apos;t leave or they&apos;ll have a full scale rebellion on their hands." They sat in silence as Cas pondered this. "Thank you, Dean, for everything. I owe you a lot for this. After today, anytime you need anything, I&apos;ll be in the kitchens." Dean smiled and hugged Cas, who seemed a little surprised at the action. They only hugged for a second before Dean pulled back and look at Cas dead-on. "You don&apos;t owe me anything, understood? I&apos;m doing this because I want to be your friend, and you just happened to come at the right time." They were interrupted by Carla walking in, her posture much better than before. "Your highness? The guests are beginning to arrive. Your father wants you in the grand hall immediately." Dean thanked her and began to lead Cas down the hall. They walked, and Dean straightened up when they got to the great hall. His parents were waiting, and he had already misbehaved enough today. Cas did the same, not wanting to make the prince look bad. The night passed uneventfully, as unusual as it was. Despite only being a few hours long, Cas and Dean bonded quickly, becoming fast friends. Dean decided right then and there that he would see Cas whenever he could, even if it meant sneaking into the kitchen every night, or even making Cas his personal "servant". He didn&apos;t realize it, but there was something more in that connection, something that his parents felt all those years back. And, whether or not it was good for him, it would never go away, not really. Because love never really fades, not when you&apos;re choosing it over and over again. And that&apos;s just what Dean did.